You are here: Home / Notes / Grow Something! Yay! Color is here! It’s been a loooooong winter. 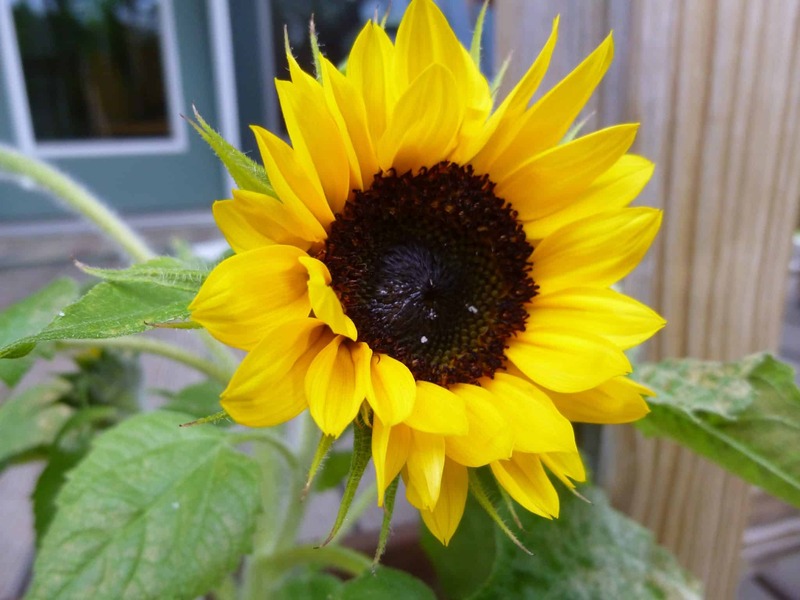 It’s even longer when you garden in Maine, but it’s so rewarding to take a tiny seed and have it grow into a gorgeous flower or a delicious vegetable. Yesterday I finished planting my vegetable garden. Although I start the season with my diagram of where I’ll plant everything, usually I end up sort of helter-skelter planting and redoing the diagram. Gardening is about the process as much as the result. 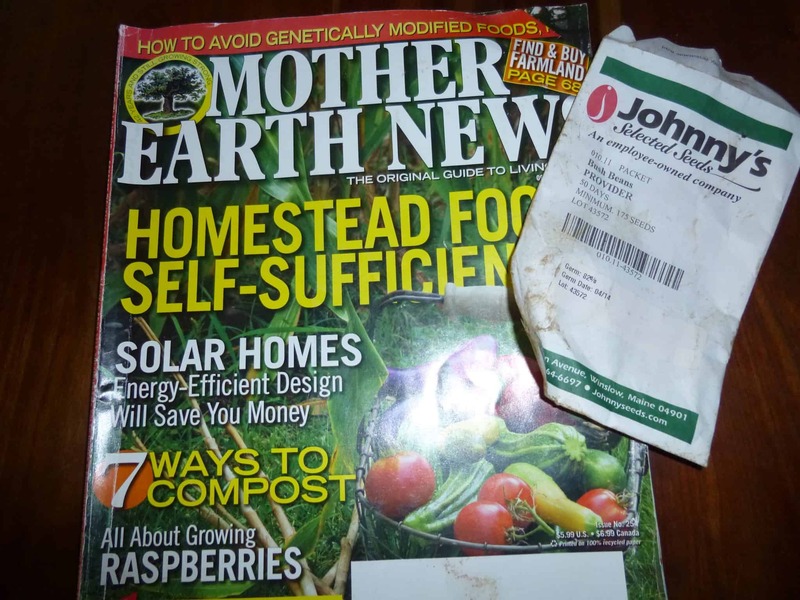 It all starts with compost! 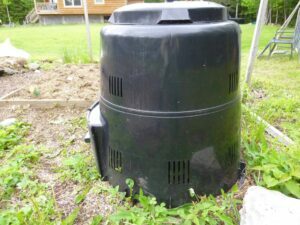 I put everything in here — dried leaves, scraps from the kitchen (except meat), debris raked from flower beds, even some manure. You want your compost to be hot so everything breaks down into a nice humus that will enhance your gardens. Manure kick starts the process. If things don’t compost fully, you may have stray tomato plants growing in places you never planted. And they won’t bear the quality tomatoes you seek. Voice of experience, Folks! 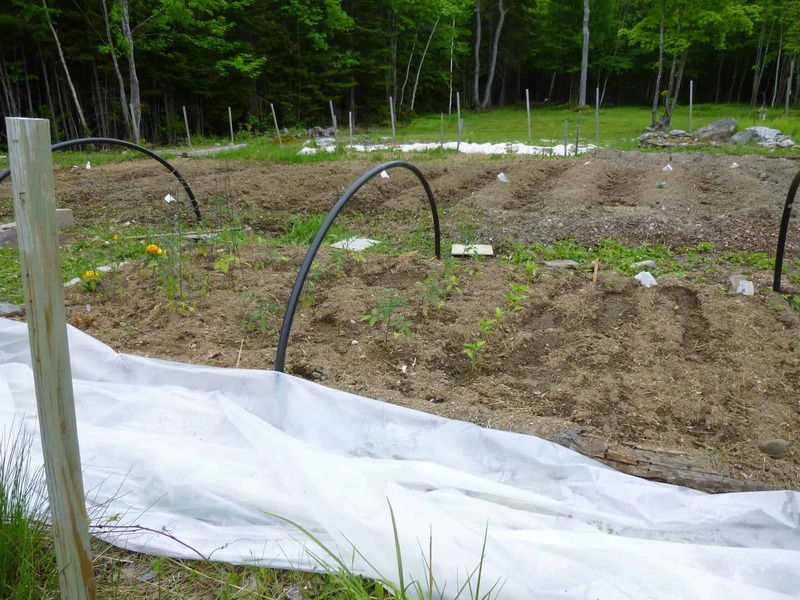 Living in Maine commands doing whatever you can to heat up your soil early. I love raised beds because they keep things organized for me. Also, I often say I’ll weed this one bed today. Makes it seem manageable for me. Notice the black half hoops over the bed. I have rebar placed outside the beds which stay there permanently. I found some old black water tubing and cut it in equal lengths. The piping fits easily over the rebar to form the half hoops. I had some scrap plastic that I put over the top of the bed and secure it on all sides with rocks, cement blocks, a hoe, whatever can do the job! On very hot (or even very sunny) days, I remove the plastic to allow air flow and to keep the plants from cooking. It’s amazing how HOT these beds can get! 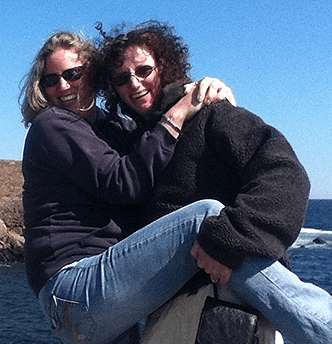 We’re expecting a frost tonight (yup, it’s June; but this is MAINE! ), so I’ll make sure to cover my beds with plastic. 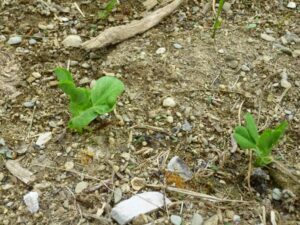 Baby pea shoots are already up! 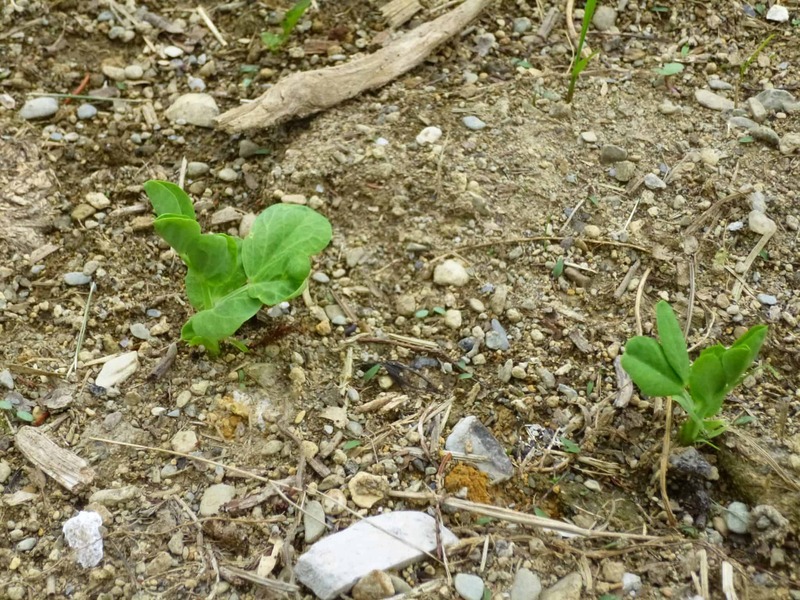 You can plant peas as soon as the ground can be worked. 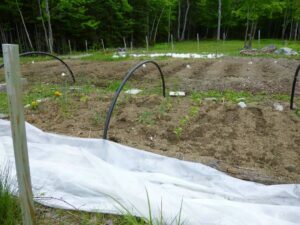 For those of you who don’t know this, in Maine “working the ground” means when you can put a hoe in the ground easily and not have it bounce back because the soil is still frozen! I plant edible pea pods. Shucking peas out of the shell seems tedious to me. I guess you could compost the pods, but I prefer to eat them. Stir-fried in some coconut oil….. oh, my!!! Asparagus! Need I say more? So good for you! So expensive in supermarkets out-of-season. 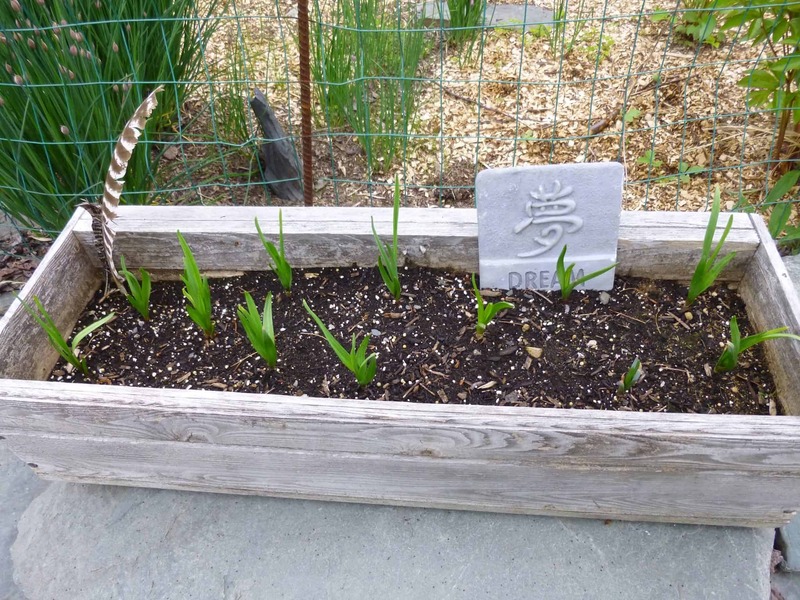 If you want to plant asparagus, you need to designate an area for it. 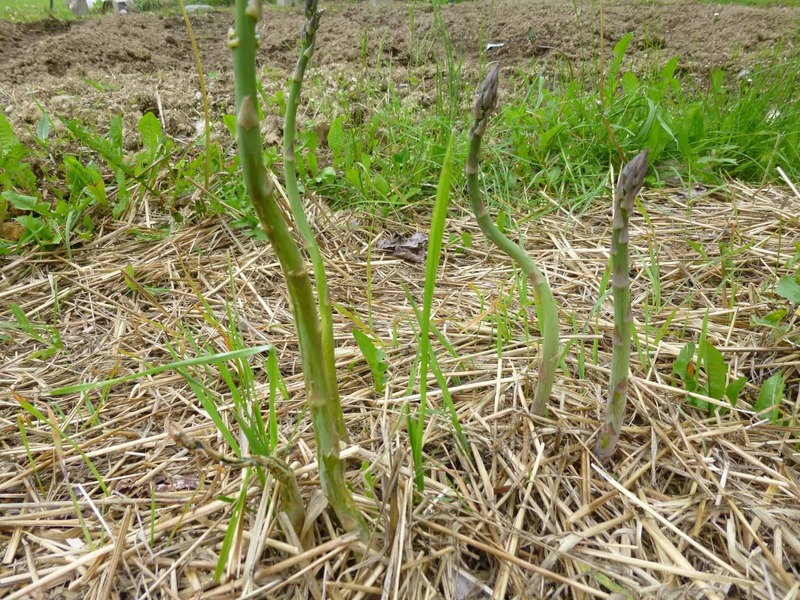 You plant asparagus in trenches and then wait three (gulp) years before it’s ready for the first harvest. BUT, if you take care of it, your bed will produce for years! Ok. So I know you see the weeds in amongst my asparagus…. Yup, I’m not a fastidious gardener. I’ll get to it. I will. Oh, and the weeds? Probably due to mulching with hay instead of straw. I don’t advise this. Garlic is a great crop to have. I planted this small, portable bed on my porch last fall. A friend had given me some heads of garlic. I wanted to plant some, but in the rush of life I didn’t get out to the garden to do it. Walking by this unused bed sparked an idea: throw the garlic in and see what happens. Told you I wasn’t fastidious. You can also plant garlic in the spring for fall harvest. Oh! 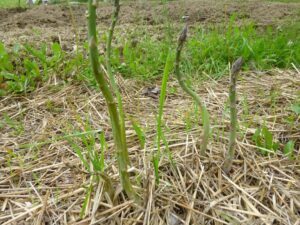 And when garlic scapes appear (long, curly growths from the top of the plant), cut them to promote the energy and goodness to grow in the bulb. But DO NOT throw your scapes away! Enjoy them in stir-frys or any way you would use garlic. Yum! 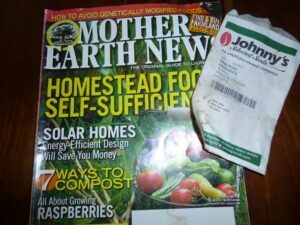 I’m not promoting or encouraging either Mother Earth News or Johnny’s Seeds, but I want to encourage you to have fun with gardening! There are tons of magazines about gardening, and in January you will want glossy pictures of veggies and flowers. Trust me! Also, Wal-Mart isn’t the only place to buy your seeds. Shop local! And please, please, please, go organic! Don’t contaminate the place you live with chemicals. There’s a better way. Always there’s a better way.